Personalized stick figure notepads with funny stick–figures can trap interests of kids and grown-ups alike! 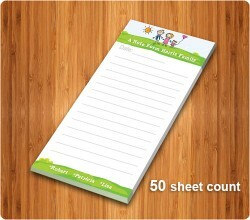 We offer a great chance to anyone who wishes to create a notepad that works best for their family and targeted customers. Moms, kids and teachers are known to be in love with these kinds of notepads due to the reason that they all wish to keep in touch! Custom stick figure notepads can be a boon to those parents who struggle to keep their kids interests high. They can always encourage kids to scribble over these notepads and keep them engaged in their tasks. We can help them to change everything right from a cartoons hair color to the color of their school uniforms! You just need to reach out to us because we are ready to get these indulging notepads customized to your heart’s content.